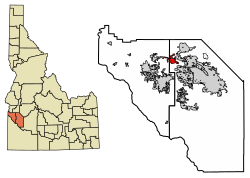 Star is part of the Boise City–Nampa, Idaho Metropolitan Statistical Area. Star is located at 43°41′39″N 116°29′25″W﻿ / ﻿43.69417°N 116.49028°W﻿ / 43.69417; -116.49028 (43.694084, -116.490225), at an elevation of 2,470 feet (753 m) above sea level. According to the United States Census Bureau, the city has a total area of 5.86 square miles (15.18 km2), of which 5.82 square miles (15.07 km2) is land and 0.04 square miles (0.10 km2) is water. As of the census of 2010, there were 5,793 people, 1,927 households, and 1,551 families residing in the city. The population density was 995.4 inhabitants per square mile (384.3/km2). There were 2,098 housing units at an average density of 360.5 per square mile (139.2/km2). The racial makeup of the city was 93.5% White, 0.6% African American, 0.8% Native American, 0.6% Asian, 0.1% Pacific Islander, 2.1% from other races, and 2.4% from two or more races. Hispanic or Latino of any race were 6.7% of the population. As of the census of 2000, there were 1,795 people, 631 households, and 485 families residing in the city. The population density was 2,092.5 people per square mile (805.9/km²). There were 681 housing units at an average density of 793.9 per square mile (305.7/km²). The racial makeup of the city was 92.87% White, 0.28% African American, 0.95% Native American, 0.22% Asian, 0.06% Pacific Islander, 0.89% from other races, and 4.74% from two or more races. Hispanic or Latino of any race were 4.29% of the population.